Image quality test results have been added to the Tamron 28-75mm f/2.8 Di III RXD Lens page. Build your own comparisons. As always, share this with your friends! 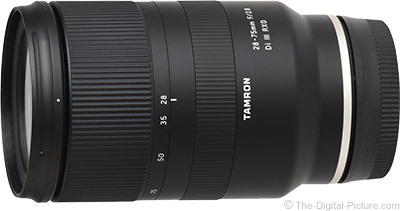 The Tamron 28-75mm f/2.8 Di III RXD Lens is in stock at Amazon and available for order at B&H, Adorama and WEX. Rent the Tamron 28-75mm f/2.8 Di III RXD Lens from Lensrentals.